Collins Booksellers - A Nantucket Wedding: by Nancy Thayer | Conversation Starters by Daily Books, 9788828329848. Buy this book online. 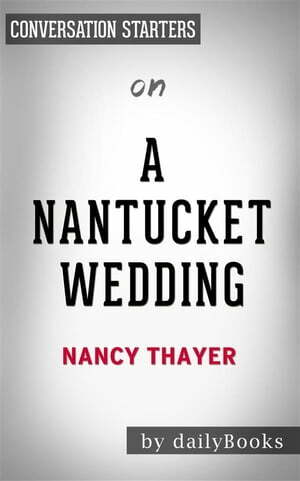 New York Times Bestselling Author Nancy Thayer another captivating novel A Nantucket Wedding. Thayer tells the story of a widow, Alison. Years after losing her beloved husband, Alison is preparing for another walk down the aisle. She anxiously introduced her fiance David to her daughters. Her daughters had a distant relationship for some time and she hopes that somehow her wedding will reunite the sisters. As the summer heat lingers, the heat of tension arise when Felicity discovers a terrible secret. Jane is attracted to her soon-to-be stepbrother Ethan. Revelations, intrigue and resentment cloud the preparation for Alison’s summer wedding. RT Books calls Thayer the “master of the perfect beach read.” A Nantucket Wedding is a walk down the aisle that you will never forget.